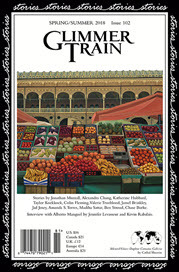 Description: Glimmer Train is a short-story magazine featuring illustrated short stories by new and published authors. Glimmer Train stories are represented in recent editions of Pushcart Prize, O. Henry Prize Stories,Best American Short Stories and other anthologies. Needs: Original short stories that have not appeared in a print publication. There are two reading periods per year for the magazine and four contests. Payment: $700 plus 10 copies of the issue for stories published in the magazine (stand category). Glimmer Train also runs contests with first place prizes ranging from $2,000 to $3,000. Tips: The editors say, "Every submission in every category is read by us, and we don't stop reading for a competition just because we've found a good story." You can also read an interview with the editors here on AWP. How to Submit: Submit through the Glimmer Train Submittable page. There is a $2 ​processing ​fee for standard submissions.